Become a pioneer. With each training mile, you’ll push the limits of your driving ability a little further toward the top and unlock new dimensions of driving dynamics. For optimal progress, the AMG Racetrack-Training courses have a modular composition. This concept accompanies you step by step — from the initial introduction of the AMG Drift Experience and the AMG Dynamic Experience to the fundamentals of the AMG Performance-Training on up to the ever increasing intensity of AMG Advanced-, AMG Pro- and AMG Pro Plus-Training. 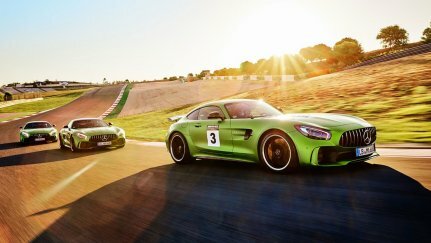 Finally, the AMG Masters and the AMG GT4 Racing Camp constitutes the ‘highest accolade’ in purebred racing machines, the Mercedes-AMG GT3 and Mercedes-AMG GT4. This intensive training course provides you with a complete grounding in professional motorsport. Do you love Performance? You’re cordially invited to visit the home of Driving Performance in Affalterbach and delve deep into the world of the Mercedes-AMG brand. Are you passionate about motorsports? If so, sign yourself up for one of the exclusive motorsports events. You won't just be a VIP guest, you'll become part of the team at the most important racing events of the year. Looking for that special something? 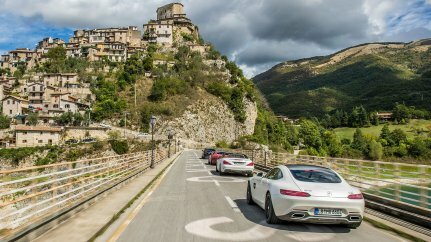 You'll find it with the AMG Experiences GmbH at some of our European dream destinations – be it on the Italian-Slovenian Riviera, in picturesque Alsace, or in the wild and romantic Pyrenees. Regardless of which AMG Emotion-Tour you opt for, get excited about unforgettable experiences and get ready for your expectations to be exceeded. Turn off the mundane and turn up the adrenaline. At AMG Winter Sporting in Arjeplog in Northern Sweden, that goes without saying, because it isn’t just you who will be drifting from highlight to highlight on meticulously prepared courses of ice and snow. Your endorphins will be too. For the new season, this exclusive driving and enjoyment event is enhanced even further. 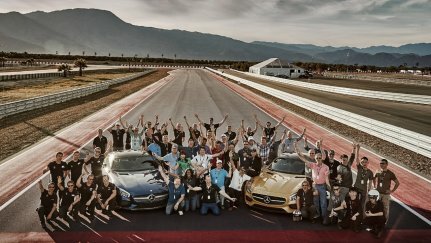 On the prepared courses that are modeled on legendary racetracks, you can refine your driving techniques, test various drivetrain systems and drift with abandon. Even the AMG Winter Sporting vehicle fleet will cause your heart to beat faster: Mercedes-AMG CLA 45 4MATIC, Mercedes-AMG C 63 S Coupé, Mercedes-AMG E 63 S 4MATIC+, and the Mercedes-AMG GT S — those are the current “snowmobiles” that you can use to hone your skills. And, finally, the epitome of exclusivity is your accommodation — the incomparable AMG Lodge in a fantastic panoramic location. Revel in its unique atmosphere, unparalleled comfort and an unforgettable view. Surprise employees, guests and friends with the tailored event modules. 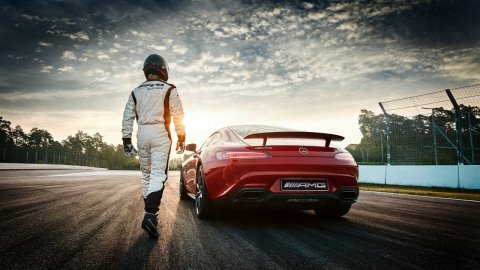 Racy training units, exciting rides in the AMG Race Taxi, guided excursions – plus an exclusive supporting program with gourmet fare or a Meet & Greet session with world-renowned motorsport celebrities. No matter what performance dreams you would like to turn into reality, your personal consultant of the AMG Experiences GmbH will do the planning for you. To AMG Experiences GmbH Website.